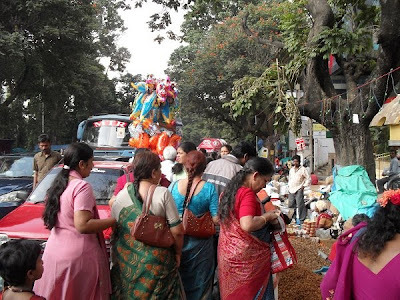 Kadalaekai Parishe is an annual festival celebrated on the last Somvara (Monday) of the Karthika month, which usually falls inthe last week of November. 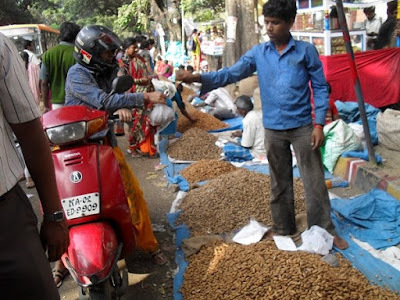 It is a time when the farmers harvest groundnuts and a groundnut fair is held for two days with great festivity. According to a 600 year old legend, a bull created great havoc to the livelyhood of the local farmers by devouring and distroying all the groundnuts grown in their fields. Unable to control the menace by any other means, the farmers finally surendered to the Lord whom they thought was in the guise of the bull, and pledged to offer the first crop to Him every year. Accordingly offering the yield to Basava - the sacred bull - and selling the produce under His surveillance became a tradition. Kempegowda the founder of Bangalore installed a huge sculpture of a Bull which was found near by, atop the hillock. The traditional groundnut festival is held anually around the Basavana Gudi / Bull Temple and the colourful 'mela' is a feast to the beholder's eyes. Farmers from not only around Bangalore but also from the neighbouring states assemble here to sell their produce. 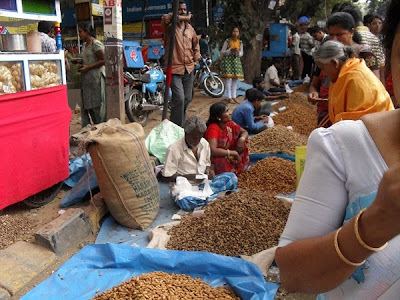 The huge mounds and mounds of groundnuts of all colours and shapes look delightful. Balloon men, bangle vendors, hand bag shops, ceramic artifacts, colourful plastics, carts selling street food, stalls selling savouries and sugar dolls, the milling crowd, and finally the traffic police booming instructions through their speakers, everything adds to the din. I managed to squeeze in into the fair with my friends on the second day of the fair, clicked a few pictures and bought Kadalaekai too!! 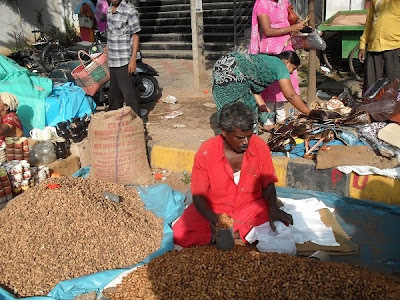 'Ochi kadalaekai' or boiled groundnuts is a favourite 'time pass' dish of the Bangaloreans. There is never a dull business moment around an 'ochi kadalaeki' cart stalled at nooks and corners, at any point of the day. A huge aluminium vessel full of hot steaming delicious ' kadalaekai' is a star attraction for people from all walks of life. Boiled 'kadalekai' is a healthy delicious snack for a cold wintery day. Thoroughly wash the groundnuts. Boil them along with the peel, along with a dash of salt for 15 minutes. Drain the excess water and enjoy. Never peel and serve! 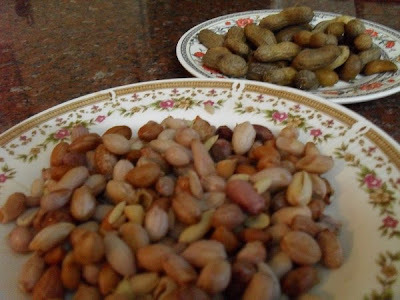 It is more fun to peel, pop, and relish the cooked hot nuts one by one all by yourself. Inspired by the 'Kadlaekai Parishe' we decided to hold 'Kadlaekai parishe' at Chitra Amma's Kitchen. 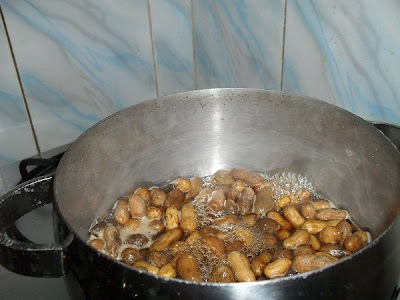 Any recipe that involves groundnuts! Mains, sides, dessert, beverages, snacks, sweets, dips - all dishes are welcome! Include a photographs of the dish. You may send as many entries as you wish! 1) Make a fresh and independent post on your blog. Please link back to this event in Chitra Amma's Kitchen. Drop us a mail with the link to your post at chitra.ammas.kitchen@gmail.com or chitra(dot)ammas(dot)kitchen(dot)@gmail(dot)com, with the following details. - This event is open till 5th January 2011. We will post a round up of all the entries within the 3rd week of Jan 2011. - Feel free to contact us via mail or the Facebook Page or in the comments section with your questions if any. It was a pleasure to see the Kadalekai Parishe pictures. My hometown is bangalore but I live in US. I miss all these simple pleasurable events of bangalore. I shall send my entry to the event soon. lovely event will surely try and participate,Do drop by simply.food some time. 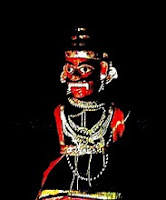 I am from Bangalore and miss being there at the Parishe..Basavangudi was my place of residence for years ever since I was a child..Miss all the fun..I will send my entries soon for the event..
How nice that you could visit the parishe and bring back lively pictures of it ! Bangalore, for all its IT Gloss, still retains its "native" soul ! Thank you LG for your encouragement and enthusiasm. Love to A1 and A2. Thaank you Veena for the kind response. Your dessert looks beautiful and delicious. Congratulations on being selected as one of the 'featured blogs for the month' for Dec 2010. Dear Gayu, Thank you for the kind response. Still grounded and happy ! Nice event. 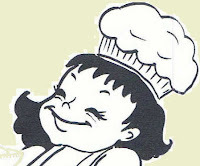 Added this to the food blog events calendar. first time here, and love your blog and the concept of this event. have mailed you my entry.